Has Arturia learned its lessons? An awesome update to an innovative but so-so sequencer/controller results in one of the year's most desirable bits of kit! Excellent build quality. Ergonomic layout. Fantastic performance device. A bit too compact for live use. Still a few obvious features missing. Arturia's original BeatStep is a standalone MIDI step sequencer that can be used to trigger both hardware and software. We liked it in our review but felt its single monophonic sequencer held back its potential.With the new BeatStep Pro, our concern hasn't just been addressed, it's been built upon beyond all expectations. 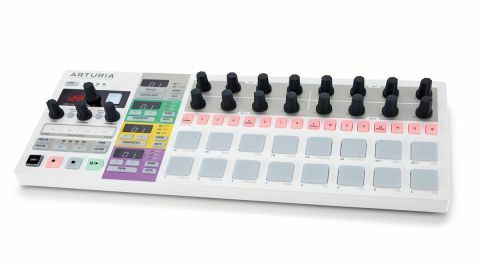 BeatStep Pro features three independent step sequencers and a set of general purpose MIDI controllers. Two of the sequencers are monophonic, intended for riffs, basslines and the like, while the third is for sequencing up to 16 channels of drums. All three are programmed with 16 velocity-sensitive pads (with aftertouch), 16 step buttons and 16 rotary knobs. The two monophonic sequencers are functionally identical, and all three sequencers share some common features. The number of steps in each is set independently of the others, to 16, 32, 48 or 64, with manual adjustment of the sequence end point allowing for odd numbers - 15, 31, 47 or 63, for example. Sequences are programmed or recorded in real time using 16 step buttons (an improvement on BeatStep, which could only be step programmed). The system also lets you choose from a range of scales or, via the accompanying software editor, define your own, consisting of as many or as few notes as you like. "Sequences are programmed or recorded in real time using 16 step buttons." There's no pre-quantise, though, so while performances are automatically quantised when you play them back, true live performance is trickier than with, say, Push and Ableton Live. For post-performance editing, the 16 numbered rotaries correspond to the matching step numbers, and adjust things like the note of each step, Shift (nudging notes slightly off the timing grid), Velocity (effectively step volume) and Gate (the length of the note). Using this simple system, even a total novice can create sequences in minutes - it's great. The drum sequencer, so sorely lacking from the original BeatStep, comes next, enabling you to craft whole live performances entirely from the one unit. It can be programmed in the traditional select-drum-and-engage-steps-for-it system, or by recording patterns live using the pads, and it works just like the melodic sequencers, but across 16 channels. Up to 16 sequences can be stored in memory per sequencer, and the whole lot can be saved into 16 global preset slots. MIDI channels can be individually assigned for each sequencer, but not for individual sequences, which would have been a nice touch, allowing live performers to instantly access other devices/instruments, simply by changing sequence. Perhaps the most obvious targets for BeatStep Pro's sequencers are hardware synths and samplers, but we had just as much fun controlling standalone music apps on our laptop. The same goes for plugins in a DAW, of course, and we can imagine many studio producers using it to create sequences on the fly that are subsequently recorded into their DAW for further editing. It can also send and receive MIDI clock, and so can act as either master or slave with almost anything. "It's an incredibly fun and versatile machine that's as useful to the studio producer as it is to live performers and hardware geeks." With that in mind, there are three main ways to connect BSP. You can use MIDI over USB, 5-pin DIN MIDI (for connection to older MIDI hardware) or CV/Gate with eight CV outputs (for even older hardware). For many, this will seem like overkill, but it's indicative of the overall attention to detail that Arturia have applied, from the excellent build quality to the exemplary layout. Details like touch-sensitive knobs, displaying their values in the three- character LCD read out, make using BeatStep Pro quick and intuitive and negate the need for a cost-increasing display. And should you wish to undertake more in-depth 'visual' programming, there's always the software editor, offering on-screen adjustment of BeatStep Pro's hardware controls and sequence information, including piano roll- and matrix-based editing, MIDI CC settings and more. Other features that we don't have space to get into fully include backwards/back-and-forth sequence play, MIDI-to-CV conversion, Roland TB-303/TR-909 connectivity, and the ability to define custom MIDI CC ranges for the knobs. On the down side, the unit could have been made a little larger, for easier access to the Mute and Randomise Current Track buttons. Some kind of MPC-style Note Repeat function would be welcome, too, as (dare we say it?) would the recording and playback of chords. While we admired the concept of the original BeatStep, its unrealised potential frustrated us. BeatStep Pro transforms a novelty for analogue synth aficionados into an incredibly fun and versatile machine that's as useful to the studio producer as it is to live performers and hardware geeks. It's by no means an essential purchase, but if you want an exciting and inspirational new way to play, program and perform music, we wholeheartedly recommend you take it for a spin.